Reflections on the creek running down Woods Canyon, Sedona - another page from my Arizona travel sketchbook. 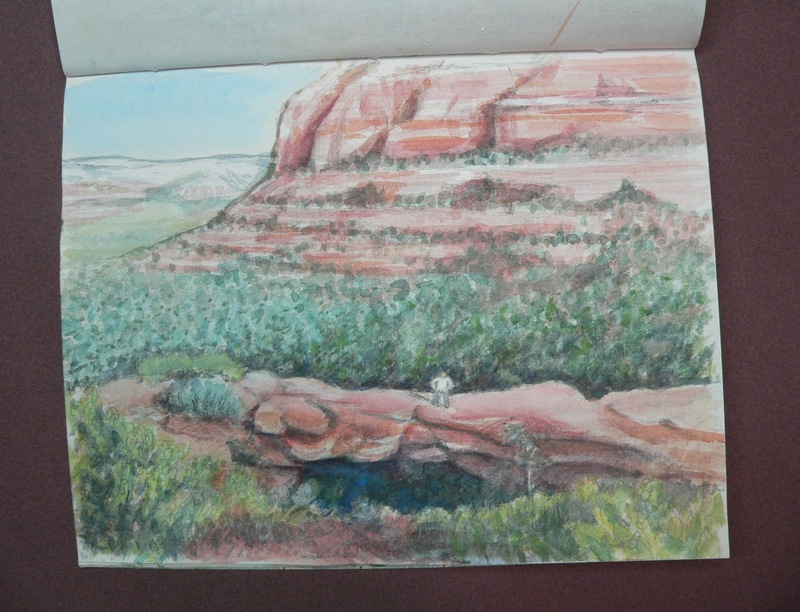 Devil's Bridge is very popular because of it's scenic views and photo opportunities. 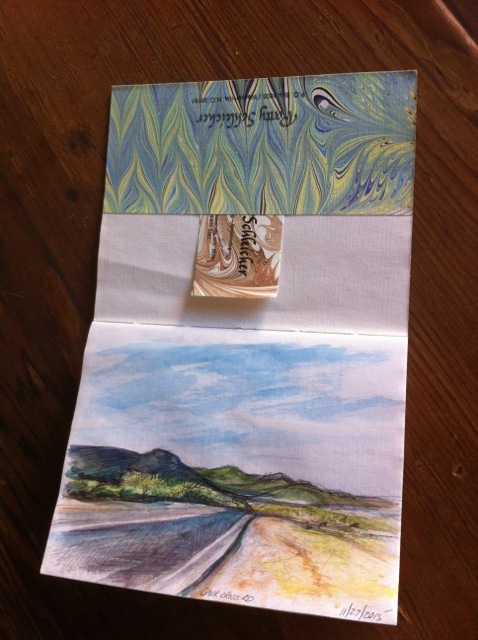 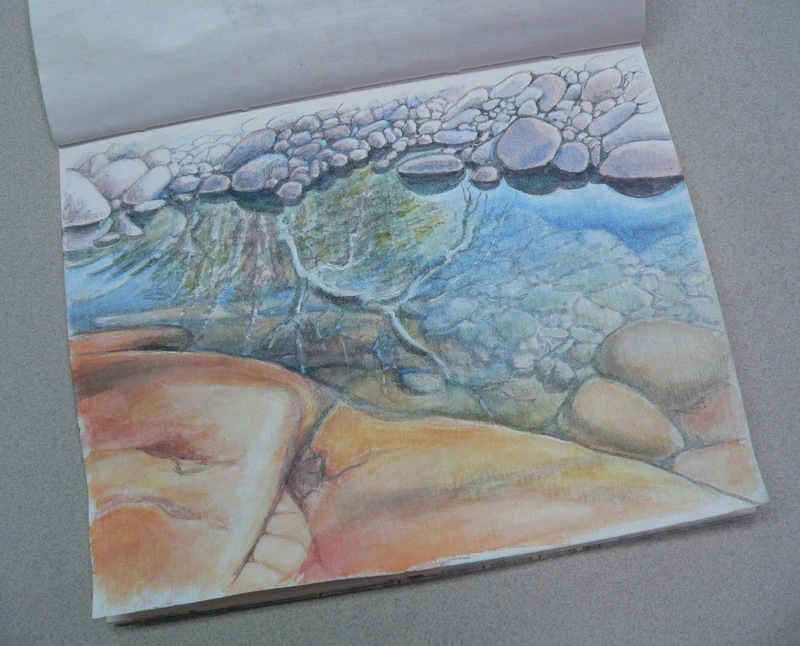 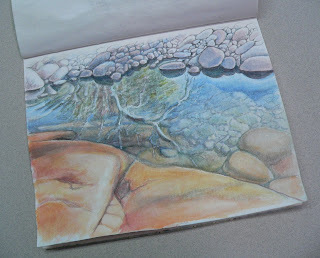 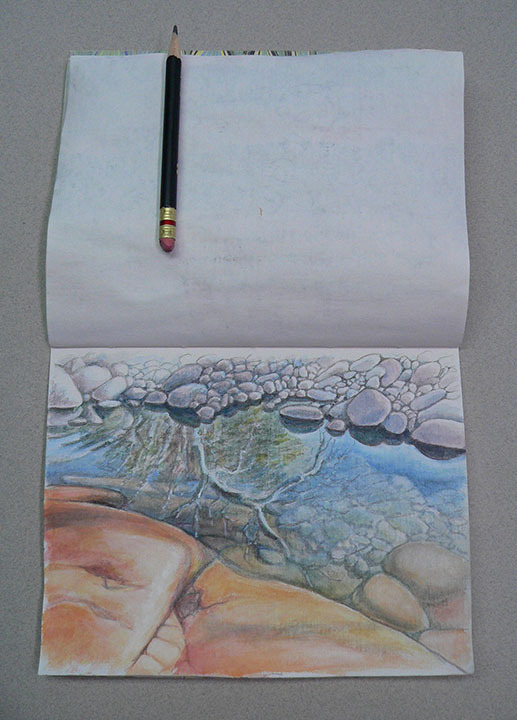 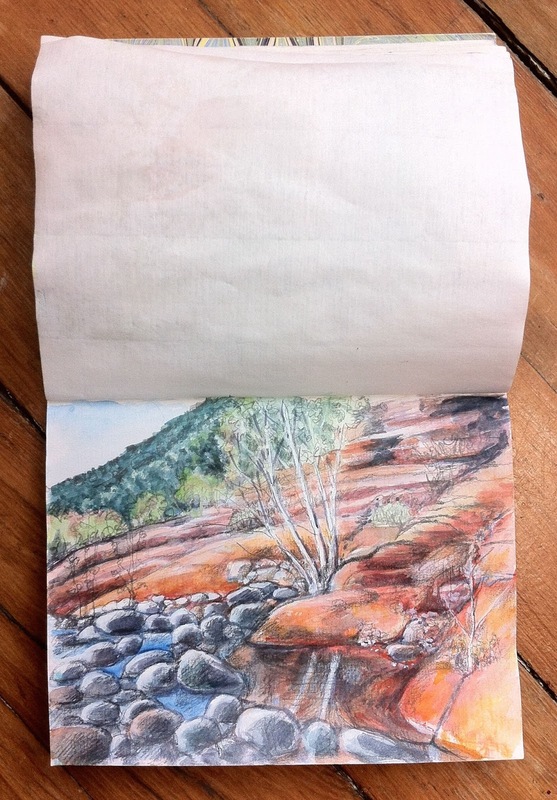 A travel sketch of boulders and sky reflections at Red Rock Beach. 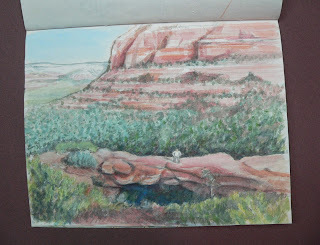 This is in the lower section of Sedona's Woods Canyon Trail. 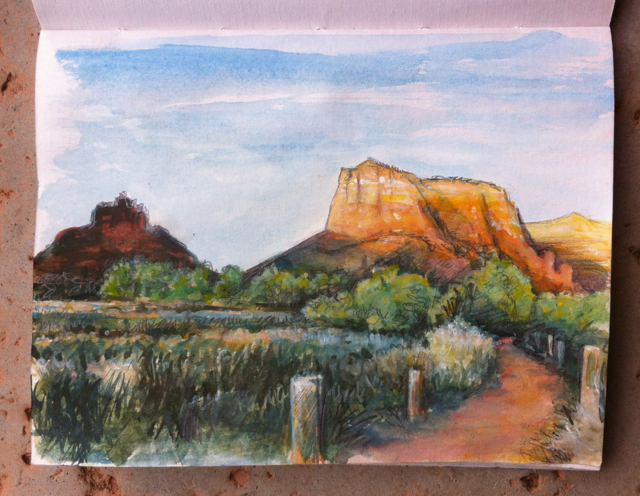 A quick sketch this morning of one of my favorite places along Woods Canyon Trail. 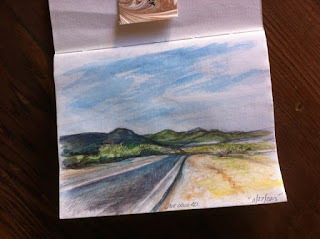 Another page from the Arizona travel sketchbook - the walk around Airport Loop in the center of Sedona. 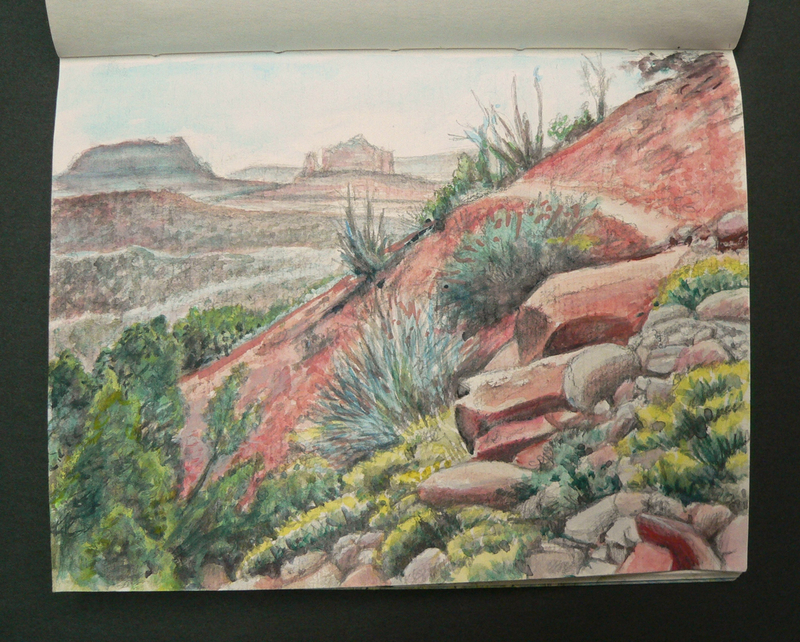 The view on the way to Chicken Point. 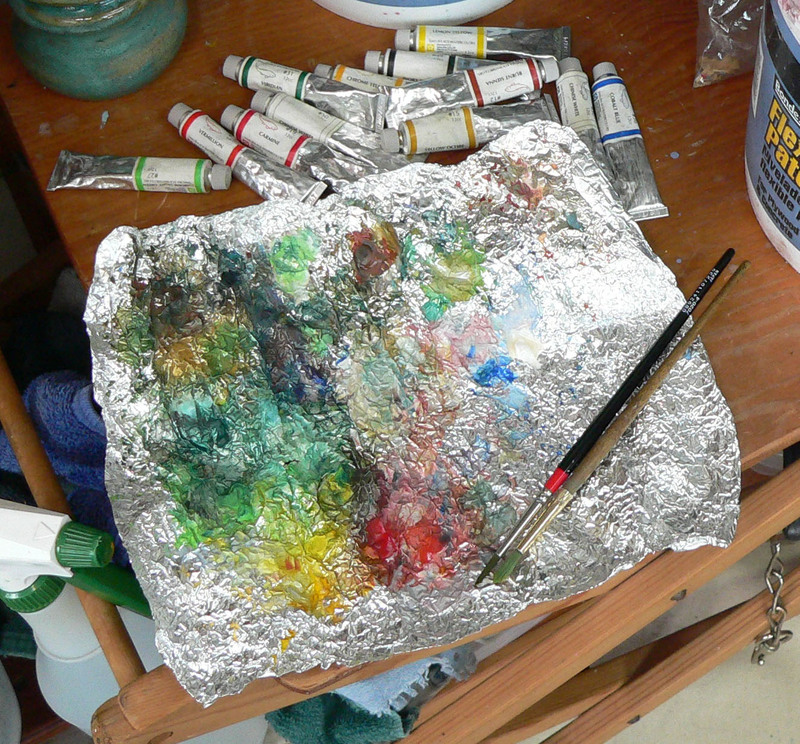 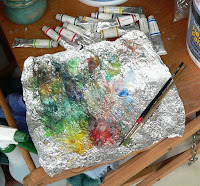 The palette, a simple piece of aluminum foil used with Sakura Koi watercolors tubes. 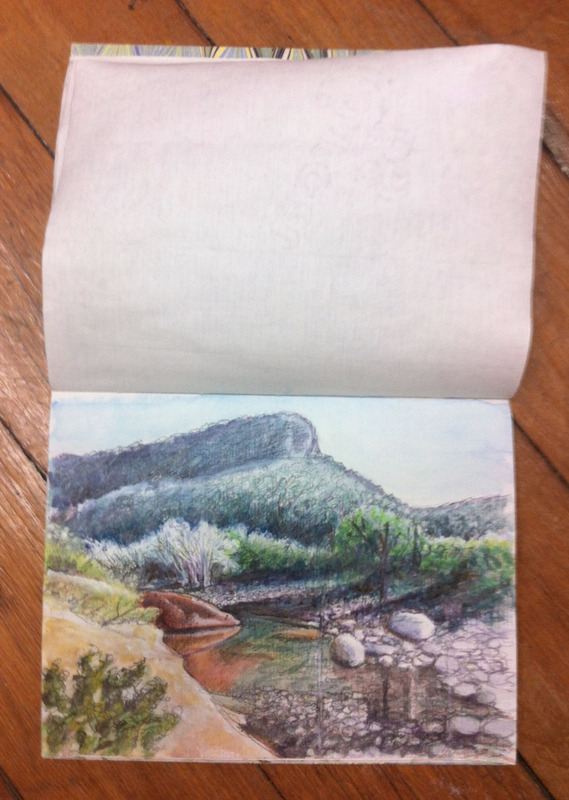 The first view of Submarine Rock, emerging from a sea of pines. 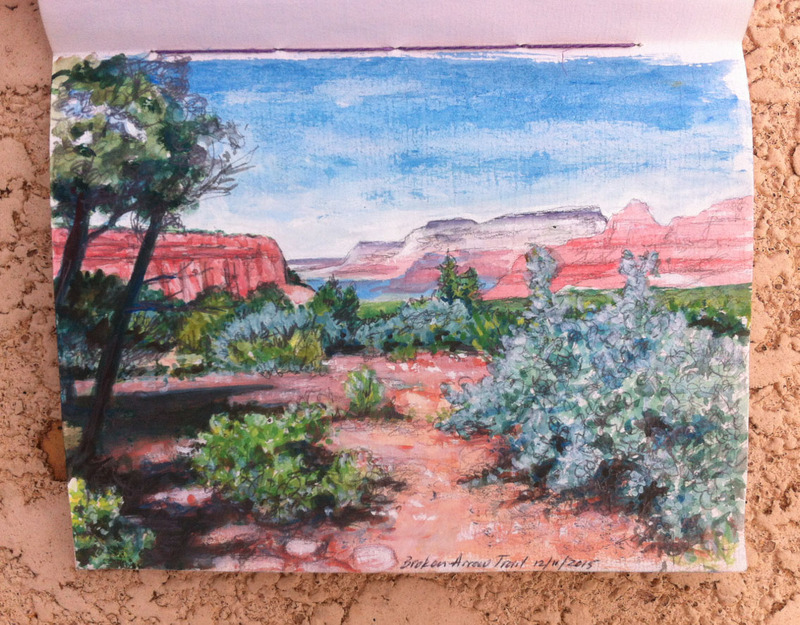 The Broken Arrow Trail is heavily traveled and parallels a jeep road out to Submarine Rock and Chicken Point. 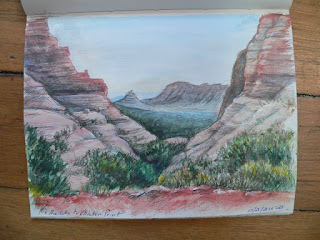 The popularity of this route is deserved, given the continuous scenic views interspersed with intimate passages through the forest. 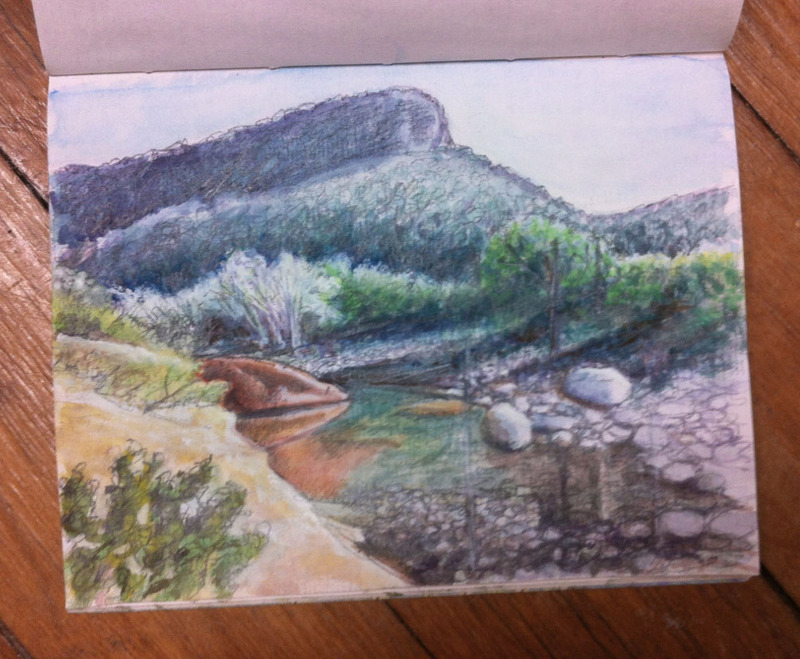 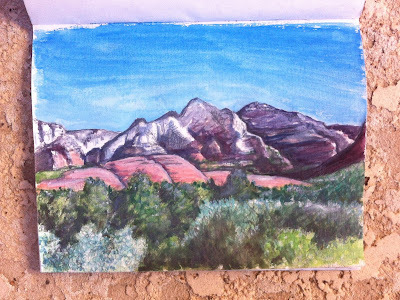 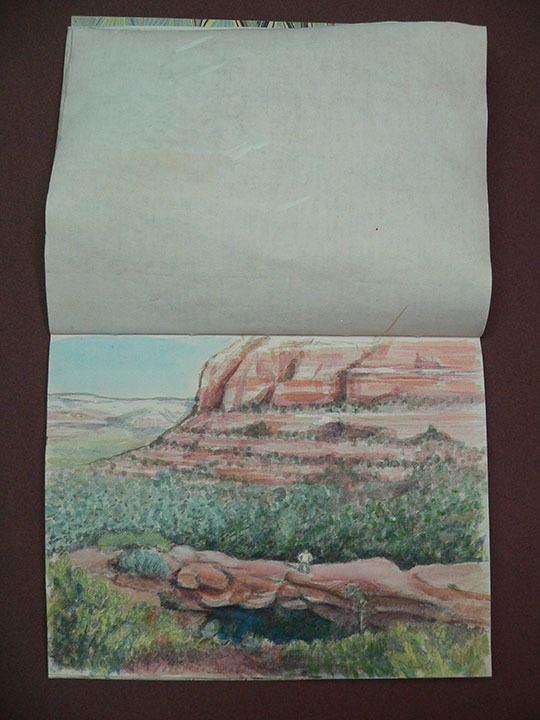 This is the second Sedona scene from my Arizona travel sketchbook. 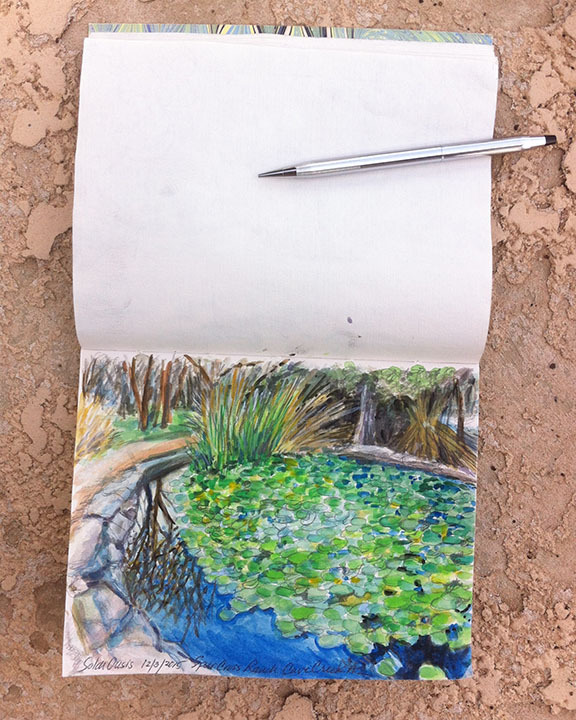 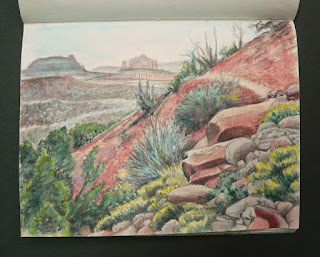 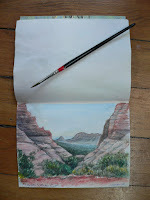 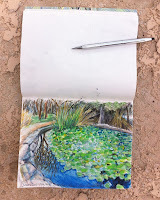 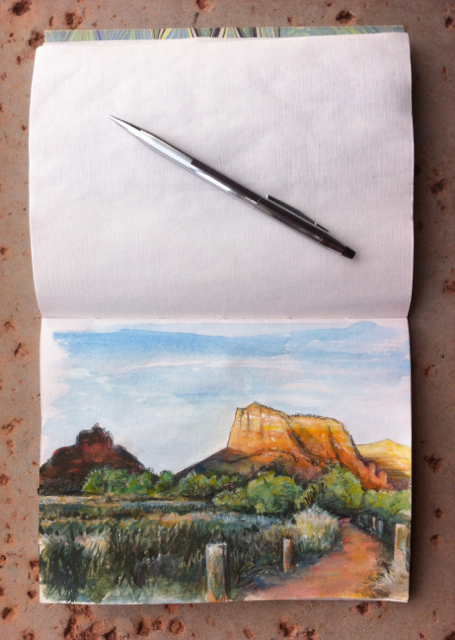 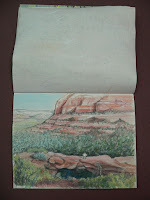 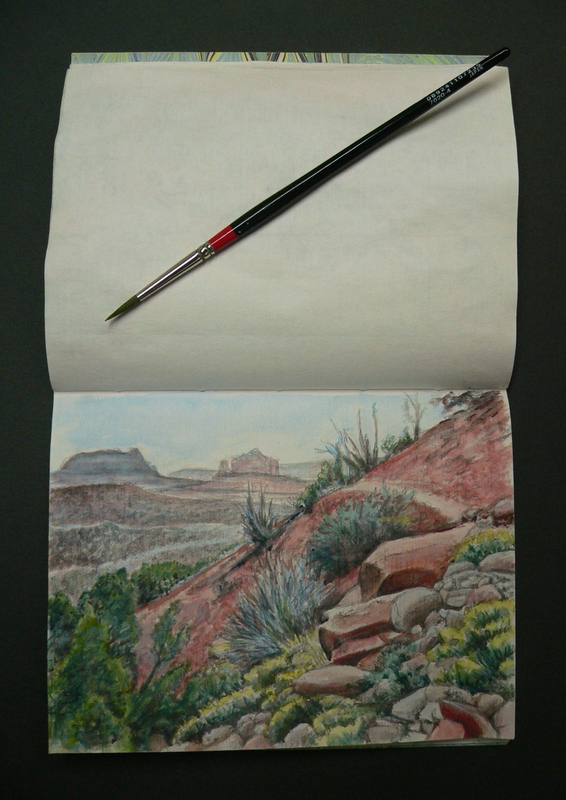 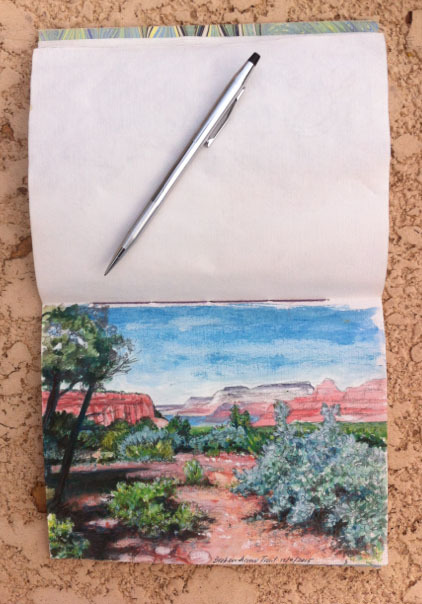 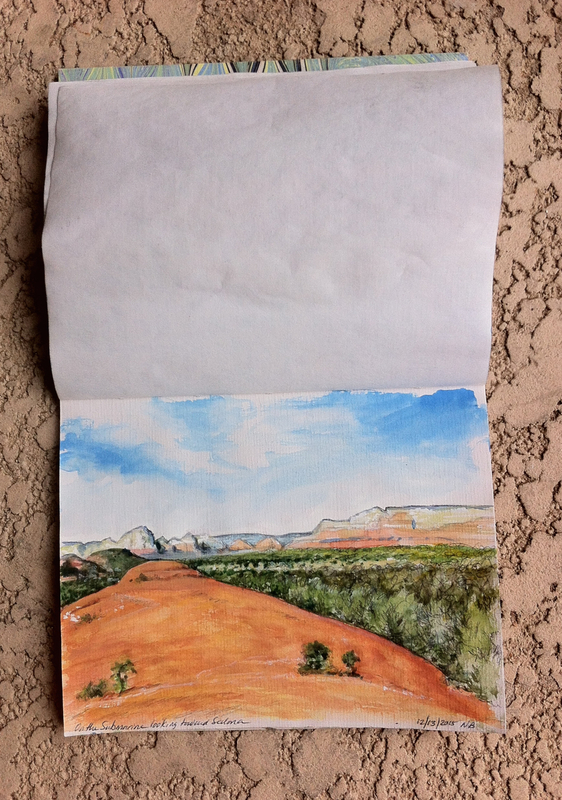 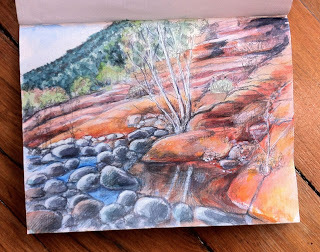 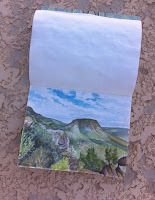 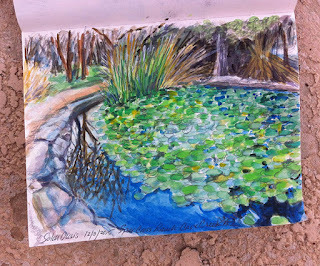 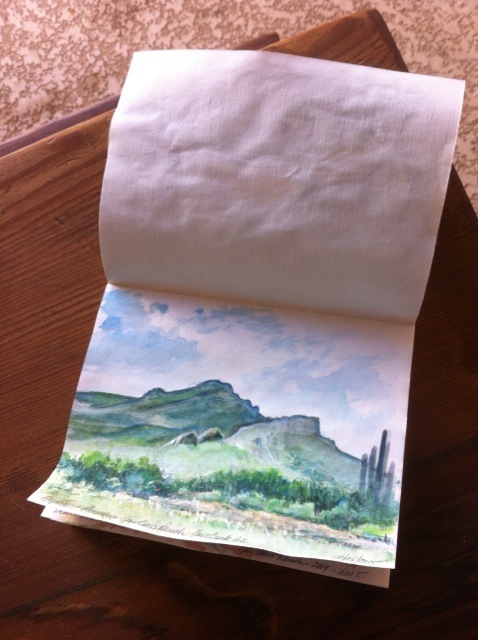 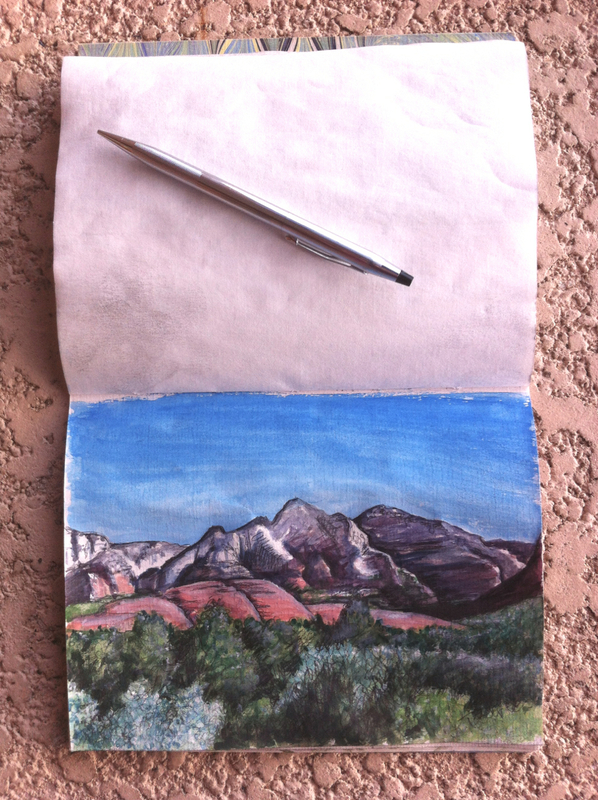 After four days of hiking, scenes from Sedona are beginning to make their appearance in my Arizona travel sketchbook. 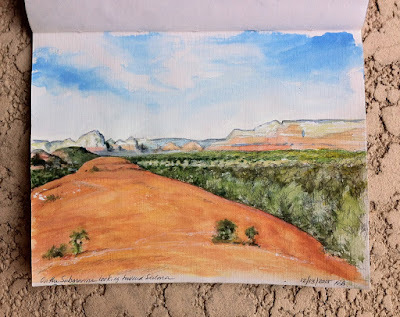 In this view at sunset, the foot traffic around Bell Rock and Courthouse Butte have been chased away as blue shadows pool across the flats and begin to flood the high ground. 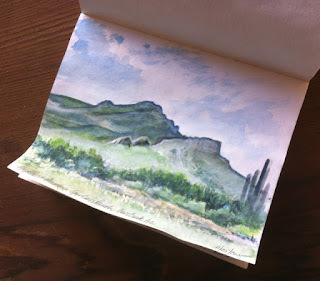 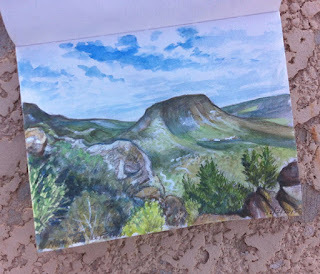 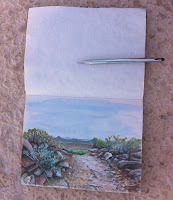 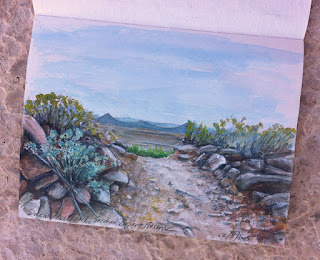 A watercolor sketch of the view looking north from the highest point on Elephant Mountain Trail, Spur Cross Ranch Conservation Area, Cave Creek, Arizona. 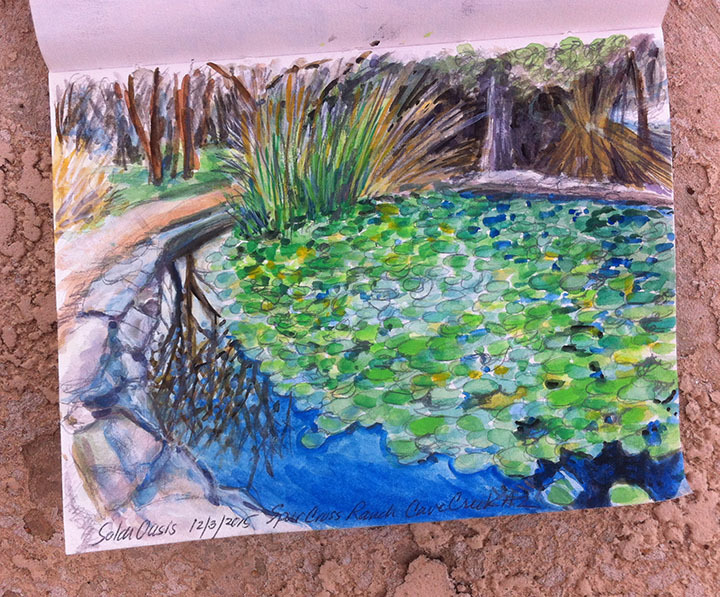 A sketch of the Solar Oasis at Spur Cross Ranch Conservation Area, where both humans and wildlife find relief from the sun, dust, and heat. 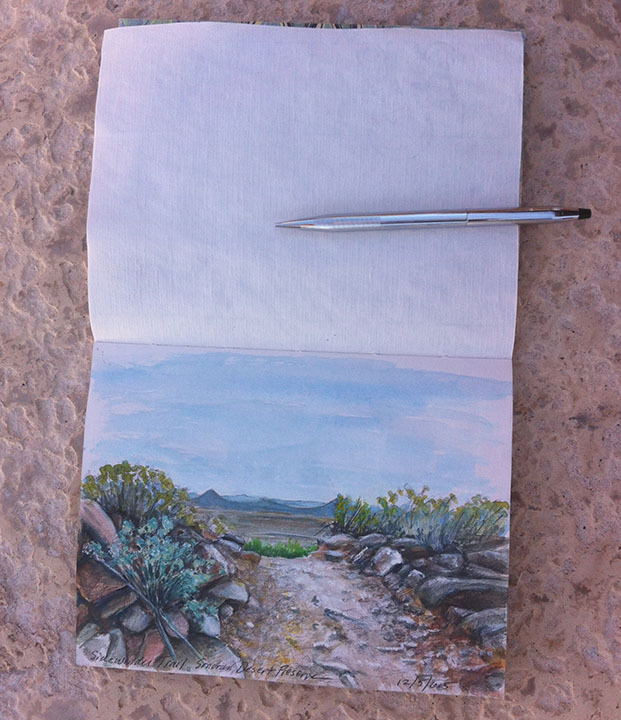 This is another sketch from my AZ travels - a view from one of the higher elevations on Sidewinder Trail in the Sonoran Desert Preserve. 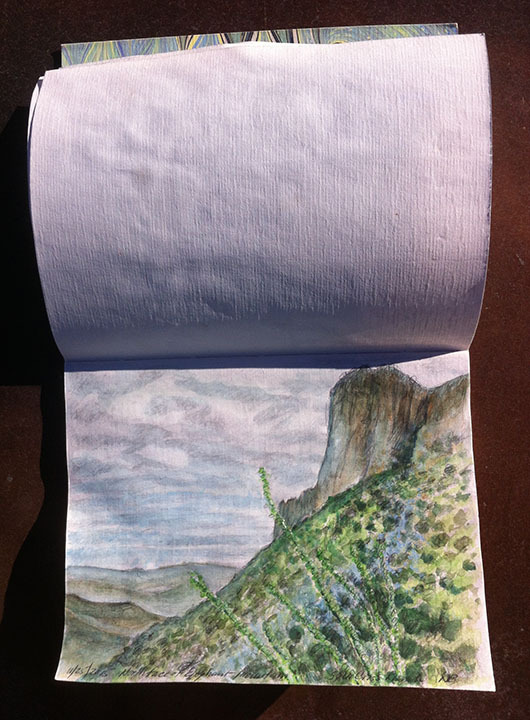 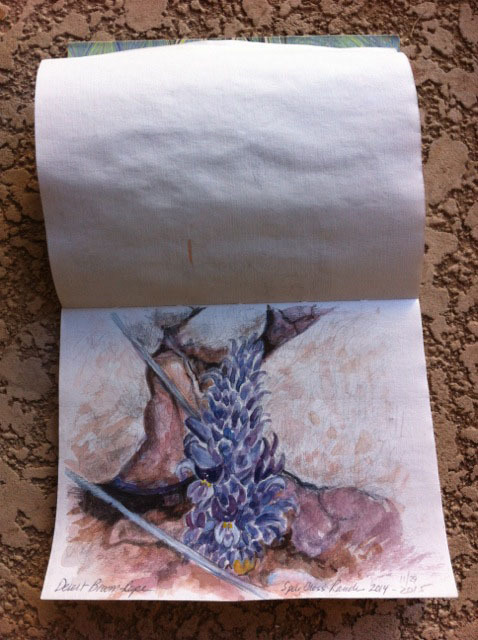 This travel sketch is from a February 2014 hike in the Spur Cross Ranch where Cooper's broomrape was found peeking out of the rocks along the trail. 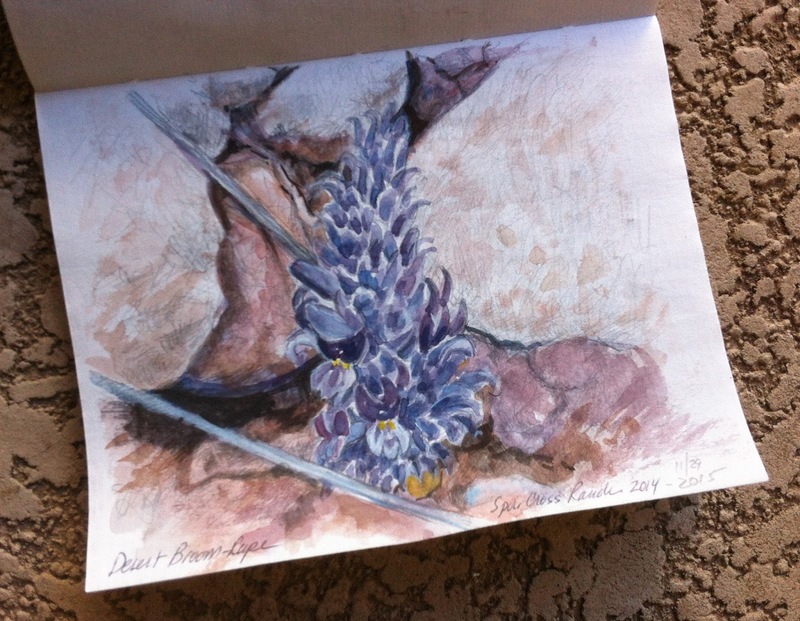 The four variations of Desert broomrape are all leafless, parasitic plants that live on the roots of native flora and are sometimes known by the more descriptive name of "burroweed strangler". 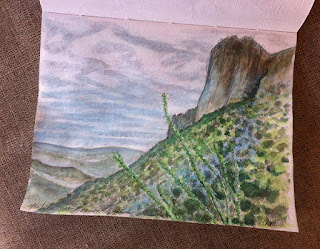 Today's offering is a sketch of the view of Elephant Mountain from Tortuga Trail in the Spur Cross Ranch Conservation Area. The Aravaipa Running club has two long distance events scheduled for these trails on February 20th. 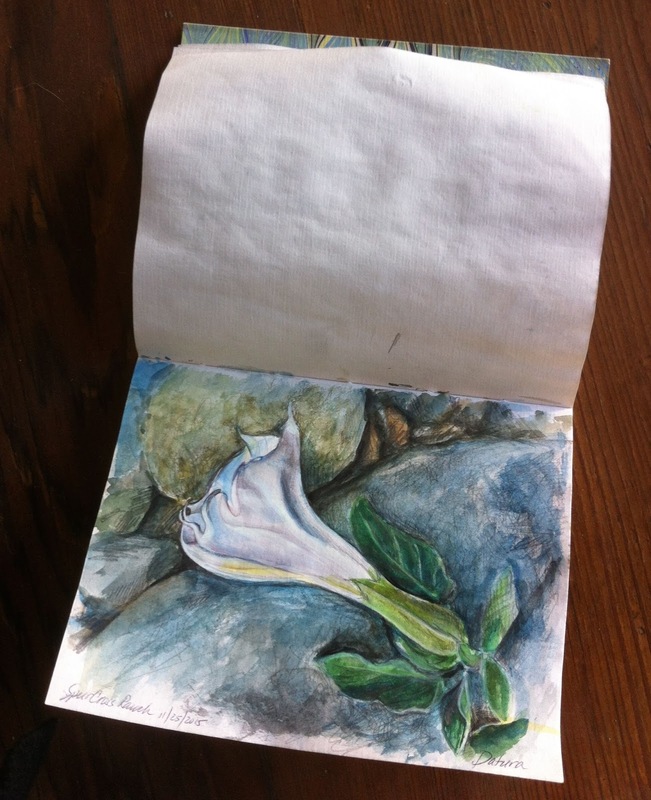 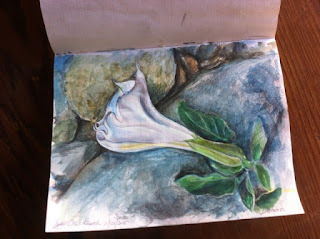 Another page out of the Arizona travel sketchbook, this time portraying a wilted Datura blossom along a trail on the Spur Cross Ranch, a part of the Desert Foothills Land Trust. Thanksgiving in Arizona, spending time with family and hiking in the foothills carrying camera, sketchbook, pencil, and watercolors. The first page of the book is a view of Spur Cross Road, traveling north into the foothills, where conservation groups and land trusts have managed to preserve some of the best hiking trails in the Phoenix area.